Who won the race? Why? You see, most people who quit trick themselves by doing what the Hare did… they tell themselves that they aren’t quitting but they are going to “take a little break”. Do you think the tortoise ever wanted to take a break? I think so… I also think that the tortoise also knew that one of the hardest parts of accomplishing any worthy goal is getting started…and once started, a winner just keeps on keeping on. 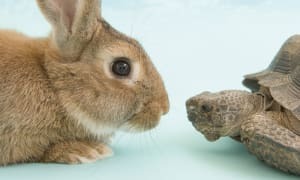 The “Tortoise and Hare” is a great metaphor about earning a black belt. The person who methodically attends two or three classes per week, every week, always gets to black belt before the person who attends every day and has to take time off two or three times a year. What are some areas in your life where you are holding back or taking a little break? How can you get yourself back on track?